You might not care what happens when a user (or web crawler) hits a bad page (404 page) on your website, but this critical page is important to both. Regardless of how hard you work to fix 404 errors, they still happen, sometimes for reasons beyond our control. With the help of some common sense, you can imagine where a web crawler has to go when they land on a blank page. That’s right, they go BACK to where they came from and give the URL they hit a big fat “F” grade in terms of value and relevancy. However, if a custom 404 page is in use, crawlers have the ability to find and crawl through links within the navigation or on the page itself; as do users. Serving a default error page might signal a Google user who lands on the page the impression that the website as a whole is actually down. However, when a user lands on a custom 404 page, they are less likely to return to Google search results and more likely to use internal site search or your navigation to get the page they were originally looking for. Below is a screenshot of a default error page. Notice that are no links or way to view other content on the website. Your only choice is to return from where you came from. 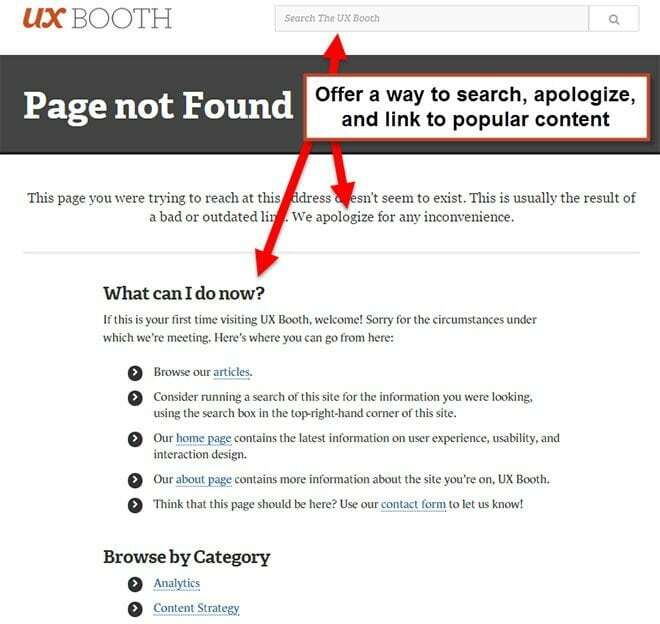 On the other hand, webmasters such as the one’s at UX Booth understand the importance of being to find (search for) the content originally requested, how to apologize for the error, and how to offer up the top content right on the 404 error page (see below). We cannot emphasize this point enough: If enough Google users return to Google results and choose a different webpage, over time the ranking of your listing will naturally go down. Don’t let this happen, fix 404 errors the moment they arise and give users the best possible experience on any URL they happen to land on, whether there is content or not.